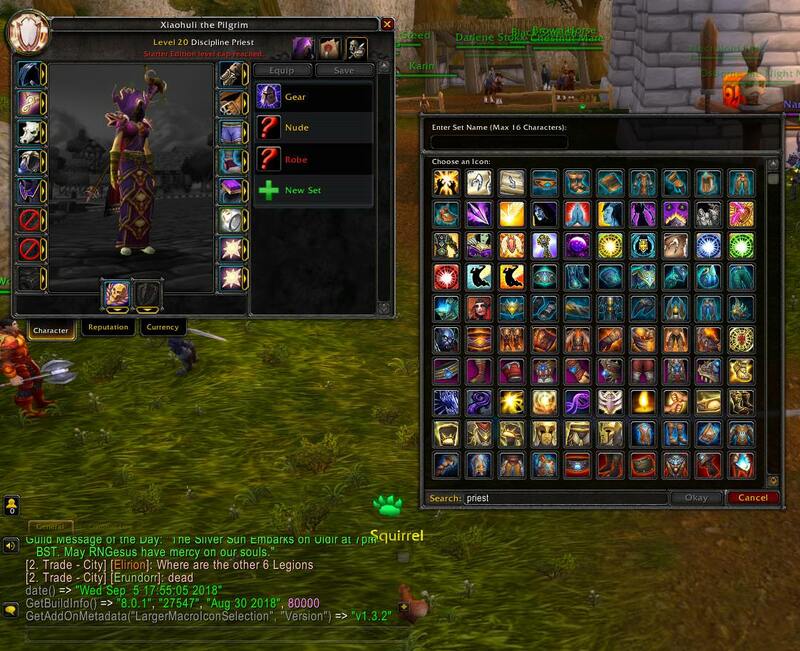 Supports Macros, the Equipment Manager, Guild Bank and includes a search box! It's already supposed to support the equipment manager, unless you mean something else? 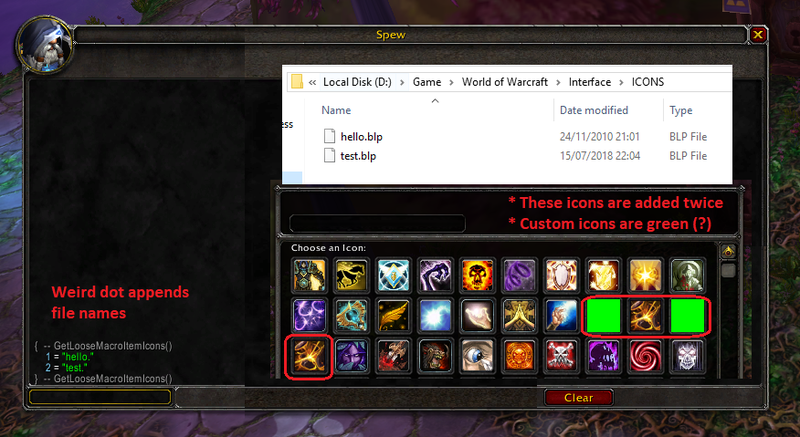 Does it work with all other addons disabled? it does not work with all disabled. the search field at the bottom is missing. The TargetNearestUseOld cvar does not exist anymore, so TabFix is broken. 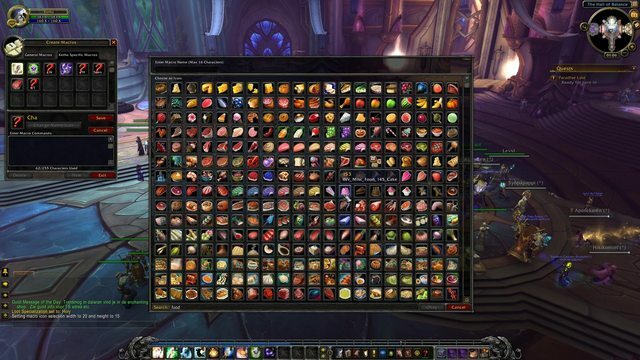 But you said you disabled all other addons?! i got the first one with all disabled. Sorry for the late reply. Are you sure this is not happening when mousing over the in-game addon list? That error also seems to imply that. But I don't understand how that would be related to LargerMacroIconSelection since it's mentioned nowhere in the error itself, unless literally all other addons were disabled except BugSack. I don't use mouseovers. Only your addon and the the requested BugSack (BugGrabber) were selected to be used. Sorry this is such bother. If it's any concillation, SearchForIcons does the same thing. Corrupt Blizz library? Bottom line is your addon works and I now have the cleanest game installation in years. I'm sorry to have caused you a bit of aguish looking for possibilities and I truly do appreciated you efforts to help me. Can you try if it works with all other addons disabled? What does this script show for you? Perhaps I found it. It seems you are only initializing the frame for the guild bank if the user is the guild master, which I'm not. In our guild some members have the right to change the icons in the guild bank even if they aren't the guild master. Is there a reason why you don't permit it? In our guild some members have the right to change the icons in the guild bank even if they aren't the guild master. Is there a reason why you don't permit it? For Macros it's working great, but for the guild bank I have no effect. No search box and no effect by /lmis 20 15 either. Do you have any tipps for me? I have some custom icons that blizzard's default icon selection frame shows (near the beginning, right before Ability_Ambush). When I enable LMIS, my custom icons aren't there anymore, and I'm fairly certain they aren't anywhere in the list, and I'm 100% certain they aren't found with the search function. My work-around right now is to disable / and re-enable LMIS whenever I want to possibly use one of those icons, but that requires a couple of UI reloads.